This conversion utilizes the spare fuse location in the Paso fuse block. It also reworks the Euro headlight switch to allow a single low beam or dual low beam operation. Disassembling the Euro headlight switch is not for the faint of heart, there are spring loaded balls inside and wires that need relocating. The alternative is to add an external switch to the handle bars. 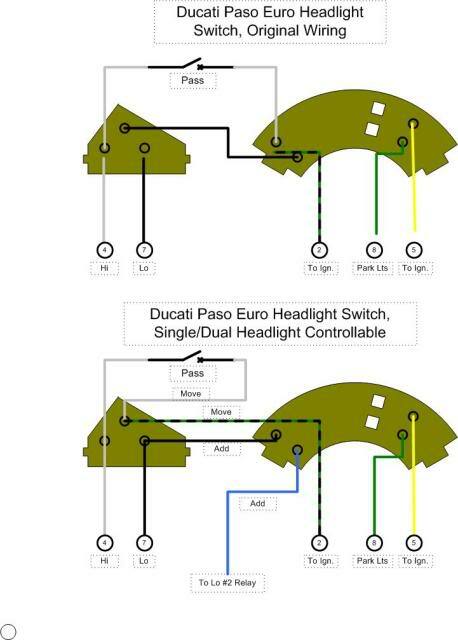 The headlamp assembly that fits the Paso is Yamaha P/N 1LJ-84303-A0-00, it sells for about $135 plus shipping , here is the site I purchased from: http://shop.yamaha-motorcycleparts.com/%20...%20/home.aspx . 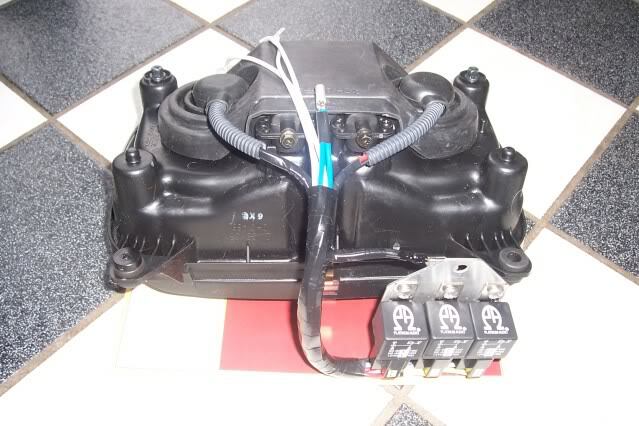 The models it fits are Yamaha 86 FZ750S, 87 FZ700T & TC, and 88 FZ750U if you are searching for one used. The front housing is actually the same as the Paso if you find a housing with a broken ear. New ones come with 35 watt bulbs that you can replace with 55 watt H4 bulbs. Some spacers may be required at the top two mounting points if you run out of adjustment down. A bracket needs to be fabricated to mount 3 relays. The high beams can share a relay, but independent low beam relays are required if single headlight operation is desired for minimizing battery drain. The bracket can use the horn mounting bolt to mount the relay bracket. Care must be taken to dress the cabling in the tight space behind and under the headlight. Is the light better IRL on the road at night? 9 points to Shelboss, as he did great job with very good diagrams... If he could add some cute girls to show all those parts(!!! ), then i could give 10 points... nice job anyway..
Could you explain what you did with the parking light, as there are no holes in the FZ headlight included for this. As in the 907 headlight the parking light is radiating within the reflector, this is not possible to realise in the FZ headlight. I am thinking of drilling a hole through the housing and reflector shield to fit the parking light, or even in both reflectors to keep it symmetrical. Alternative would be to use the same center spot as in the 907 headlight and fit some sort of reflector directly behind the bulb or use reflective alu tape. Thinking is in progress still. Perhaps glue a reflector there using the rear of the housing for access. Have to find a suitable reflector at a scrap yard for cars using the blinker. Problem is that once the holes are drilled, there is no going back. Could you drill a hole in the reflector, enlarge it using a soldering iron to melt and avoid braking of the reflector? Would there be a risk that the parking light touches the main light? Furthermore thinking of using only 2 relays for dim and high beam only, both lights in dual use at the same time and different location of fuses in order not to loose all light if one fuse blows. Some minor modifications to the schedule you've posted, that is always possible to modify back to original situation. Additional modification would be to draw the supply to the Garmin Zumo charging block from the parking light, so charging only takes place with the motor on contact and lights on. Fitting the Garmin powerblock on a bracket using the bolt and vibration rubbers that also holds the cooling expansion tank. Should be enough room there, can tyrapp the extra wire using the metal frame surrounding the headlight. 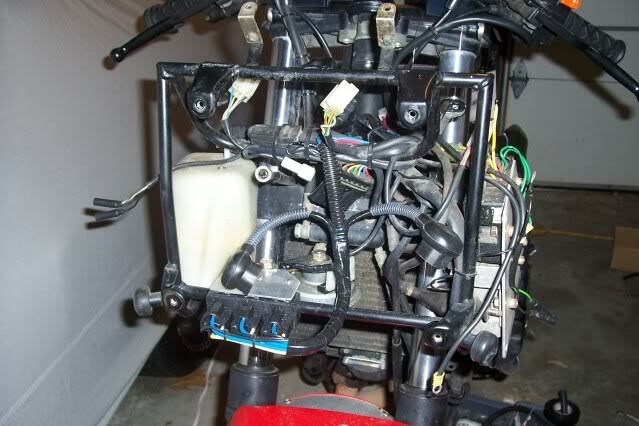 Fuse can than be located behind the front fairing, replacing a blown fuse would result in dismounting the front fairing. Fuse would be reasonable water free behind this fairing. I just drilled the hole for the parking light from the bottom, between the Reflectors. Works for me. After modification and a first good run without problems, I have a alarm light on, no battery charging when running, and indeed charging the battery is not taking place. A dead battery does not bring you any further. I drained the battery and hoped the engine would still provide energy to the electrics, however it did not. Ignition failed and that was the end. Had to charge for an hour at a local farm to make it home. I replugged the headlight to single light, disconnecting relays and power supply hoping this would solve the charging problem, however the problem remained. Any idea if this could be related to the dual headlight? False current flow or too much load on the original rectifier that can not handle this? What would be an alternative, more powerful rectifier to fit? Have to brouse this forum on this matter, so a link would help me as well. Most likely the issue is the stator/wiring/regulator At best your stator is 22 years old. On a 907 you could have one of two different stators.The difference is the way they are wound. To avoid an argument and a distraction lets just say there is a two wire and a three wire wind for the Paso. Year has nothing to do with what you have it just depended on what Ducati had the day your bike was built. Thanks Higgy, will have to look into it sometime next week. Did find out this easy trouble shoot scheme for locating the problem. Hope it will be the regulator as it is a more easy fix for me. Voltage will be a steady 12,5 V running or not running over the battery for as far is I can tell now. . .
Well, I had to know what was going on with the bike, so as I am working from my house today, I took a 30 minutes coffee break in the garage. Yellow wires connector from the RR have been melted solid with the connector coming out of the wiring bundle. Cut it free and inspected it. All shiny new looking connections. Red wire connector looks fine and the black and white wire connector looks fine to. Obviously a high current from the generator to the RR caused problems. Measured the bridge between red an yellow wires, multimeter in resistance in diode measuring mode, measure a connection between circuits of 0,3 to 0,4 on both directions. One direction should have a high resistance, the other direction a low resistance. Guess mine is broken and would not like to open up the generator in the engine as I am not that familiar with that and might damage more than I fix. Resistance over the yellow wires from the generator is about 2,4 Ohm. Seems too small for a generator wire. Will this have failed too? Wonder why I have to pay more than $ 40 for shipping US to EU. Will they goldplate it on the way to me? A low reading of 2.4Ω is normal across the yellow wires from the alternator. You should also check that there is infinite resistance between the yellow wires and ground. 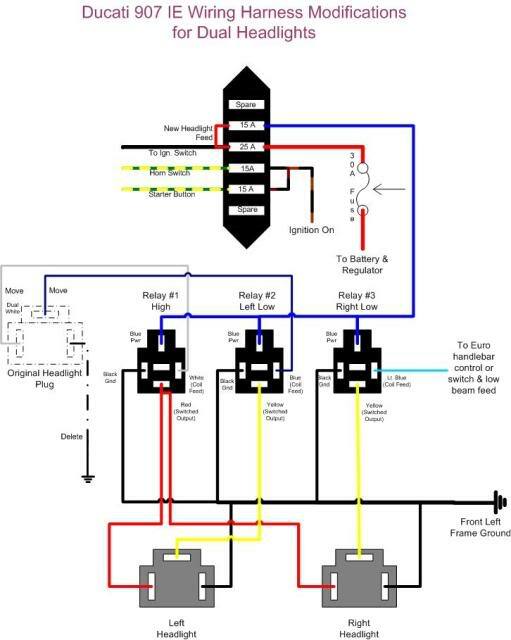 With the bike running and the regulator disconnected you should read about 12 - 15Vac per 1000 rpm across the yellow wires. So expect about 45Vac at 3000rpm. It sounds like your regulator has failed and a replacement should get the bike charging again. Yes, was thinking about is, in a static measuring of resistance, you only measure the resistance of the wire, so that value is completely logical. Well, started the engine, rev it a bit an a nice voltage was produced from the regulator. What remains is ordering a rectifier regulator. Hear good things on de RR51, sold by other companies as "their own" with reference numbers like CARR511 at Carmo, being the RR51. Prices will not be too different, all about 130 Euro including shipping, VAT, exchange rate, as it looks cheap being only € 90,75 at Electreworld.com it still is about € 125 total. Will buy it in the Netherlands, as delivery will be faster. And it has been ordered at Carmo, no more guessing, thinking or checking, just waiting for the postman to arrive and fit it in. 907 Operational for the weekend, as I have a birthday party with bbq, daughter has become 13 and mostly all nephews want to have a short ride on the bike, and my children a long ride this Sunday to taste some icecream at a pitstop.